A student will log in with your Classroom ID and password and select Students, choose the appropriate name and select Check Out & Read. Select the eBook title for check out by choosing Check Out Book as shown below. A successful checkout message will be displayed with an option to Read Now as shown below. By choosing Read Now the eBook will open in a new window. The web browser settings may need adjusted to allow for pop-ups. If using an iPad, disable the Safari Internet popup blocker (this option can be found under Settings and then Safari). Students can use the eReader toolbar menu to make the reading experience fun and interactive. 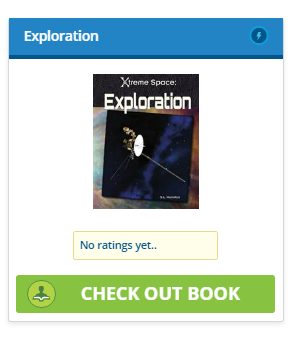 As the teacher, you can use the eBook reports to see what words your students are looking up in the dictionary, the number of seconds on a page and how long the student had the eBook checked-out. To close out of the eReader, simply close the browser window. The eBook will still be checked out to the student and the student can access the eBook again at anytime by signing into the student page, choosing their name and entering their password. The student will need to select Checkout & Read to re-enter the library and scroll to the bottom of the library page to view eBooks I'm Currently Reading or to see eBooks Reading History as shown below.